The Broke and the Bookish want to know what’s on my Summer TBR list. I’m in such a disorganized reading phase. Disorganized in a good way. My monthly new release TBR posts are kind of my guideline for most of the fiction I read. But I’ve been enjoying so many backlist books that there is nothing really set in stone for the summer. Well, aside from revisiting Judy Blume, Shirley Jackson and Harper Lee, most of my fiction reads are up in the air. So I decided to visit the nonfiction section at the library to get ideas for what to read alongside some of those backlist and new release fiction books I have in mind. And a goal for myself is to read more nonfiction. I really enjoy podcasts, so maybe I should approach nonfiction via audio. I also LOVE reading self-help, DIY, travel and cookbooks, so this list was much easier than I thought. With all the bounty I hope to receive from the garden, I must cook right? If not successful, we have fabulous farmers markets available all over the place. And to end the list, I need some self-help books to keep me sane this summer. These two are newly downloaded audio books from the library and I look forward to them. I’ve always wanted to read a book by Brene Brown after watching her inspiring TED talk and Kondo’s newly released book is perfect timing after going through some home reno. What’s on your radar for summer reads? 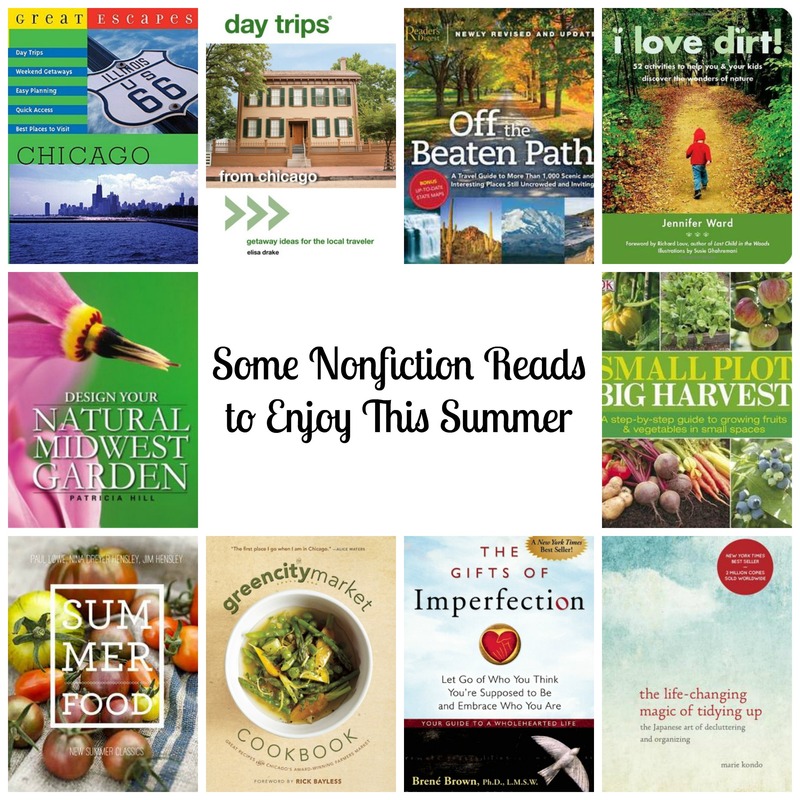 Tags: Chicago travel, gardening, nature, self-help, summer reads, top ten tuesday, travel, wanderlust. Bookmark the permalink. Previous post ← Making Room On The Shelves For These Six New Releases in 2015. I’ve gotten where I enjoy NF more and more these days. Great list! Thanks! I usually struggle with nonfiction but these types of reference style informative ones are great in between fiction. I Love Dirt immediately caught my attention because I’m always trying to get my kids outside when the weather is good and hopefully foster a love of nature and exploration. I have to admit it’s a struggle sometimes. I really am enjoying it. Some reviews call it a bit juvenile and for younger kids but the reminders to be more present in nature can apply to all ages. We’re going on a cross-country road trip soon, so we’ve bought tons of travel books. And one of my favorites, if not the favorite, is “Off the Beaten Path.” I like that it points out interesting places that typical tourists tend to miss (smaller crowds is always a plus). And that it has a clear layout – each attraction is referenced on a readable map. Easy to read and follow. Oh, and pretty pictures. The only downside is that it’s kinda heavy. Naturally, I was excited to see that you like it too. One of the attractions closer to Chicago is the Illinois Railway Museum. I like trains so I’m gonna try to go. Yay! It is heavy so not something to travel with but great for planning. They need a travel version! Are you gonna be in Chicago this year? Chicago – undecided but possible. We’ll be on the road this summer and fall, but the itinerary is still up in the air. We’ve been to the city before and loved it, but we didn’t see much of the suburbs so maybe we’ll see them this time. I sometimes make it a point to peruse some travel books; mainly Lonely Planet ones, just to see options in future destinations (or what’s being talked about at that moment). I have severe wanderlust and love looking through travel books.